I’ve been cooking a lot from my newest cookbook – Tagines & Couscous by Ghillie Basan, and I’m thrilled to say – we’ve been enjoying the results – I’ve made Creamy Shellfish Tagine with Fennel and Harissa, and it was delicious. I’ve never cooked with fennel before, but I’ve decided I really like it. I also made Beef Tagine with Sweet Potatoes, Peas, Ginger and Ras-el-Hanout… which was described as ‘fairly firey’ and – given that we don’t really do firey in this house, was a bit daunting. But, it turned out to be very gentle. I suspect we may have a different blend of ras-el-hanout and that may be the difference. Though, it is difficult to imagine a spice blend that includes rose petals, as ever being firey 🙂 I perked this tagine up with a generous blob of yoghurt with lots of mint chopped in, and some finely sliced slivers of preserved lemon. And, in complete fairness to the author – she does suggest doing just that! Anyway – I have been forgetting to tell you how this romance with middle-eastern flavours came about. That went so well, that I got brave all over again when we went to Wellington for a long-weekend. I asked Julie – who writes a lovely blog about her cat Poppy (yes – I DID steal my Poppy’s name from her Poppy!) http://poppyq.blogspot.co.nz/ You can meet Poppy and her Julie too. We met for a drink, then went to dinner – to a tapas place near our hotel. The food was lovely – as was the company – so you can blame Julie for this fascination with these flavours. 🙂 Meeting fellow bloggers comes highly recommended! I know corn is not Paleo/primal (corn is a grain – great for birds and rodents, not so great for people) HOWEVER – sometimes I just want to pretend… ok? Don’t shout at me! Well I *was* going to shout at you when I saw the title of this post, but now I see that it’s not wheat couscous so I’ll shut up. I’ll just mutter a little. Sometimes you just have to pretend. OMGosh! I miss couscous so much. Have you tried it yet and I am going to guess that it doesn’t taste like proper couscous. Please tell me I am wrong. 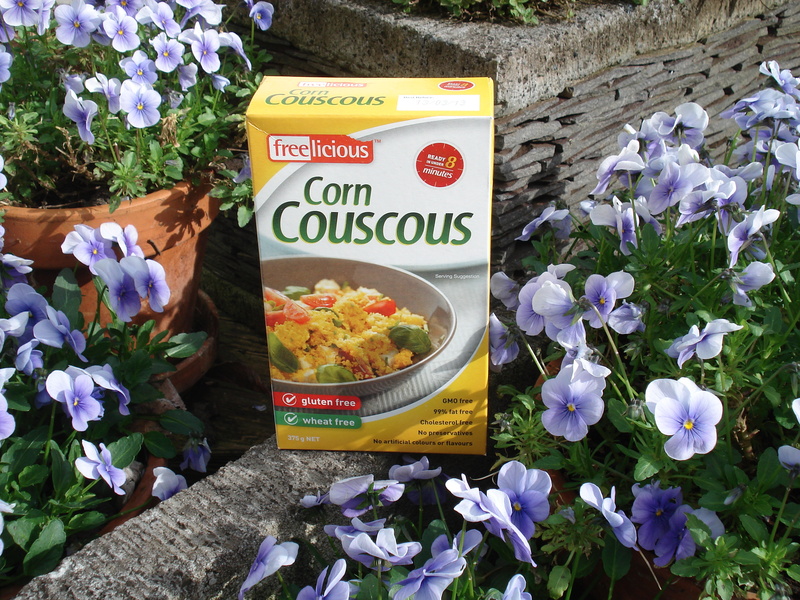 Wow…I have never heard of corn couscous – sounds wonderful. We always use Quinoa in place of couscous which works out well….I would love to try a corn couscous – yum! Quinoa does my gut in – sadly… I had thought of using millet, which I like, but when I was in the health food shop this morning found millet described as ‘nearly’ gluten-free!!!!!!!!!!!!!!!!!!!!!!!! Isn’t millet gluten free as long as it’s processed in a GF facility? I’ll squint sideways at the corn coucous until you tell me how it was – sounds dodgy to me. oooh I saw that too but haven’t tried it either, I’ll definitely give it a go. And NEARLY gluten free???? That’s just insulting!